Sometime in 2012 I was watching The Doctors (love this show so much) and something Dr Travis said got my attention so much that I had to research on it to find out for myself and also practicalise what I just learnt/discovered. He said something in this nature ''If you want to lose weight without dieting or exercising, then you need to stand more than you usually do. After sitting for a while in the office or watching television, stand or walk around. Try standing during TV commercials, try using the stairs rather than the elevator''. I was fascinated and I started telling my loved ones what I just learnt or discovered. All thanks to Dr Travis from The Doctors show. Now let's analyse the effect of sitting too much and the benefits of standing. -The more one sits, the more weight one tends to add. - The more one sits, the more tired/inactive one become. -The more one sits, the higher one's chances of having heart diseases. - The more one sit, the more one's chances of falling ill.
Head- Blood clots that form after sitting too rigidly can travel to the brain causing strokes. Lungs- In individuals who experience heart failure, fluid first backs up in the lungs. Neck- Fluid retained in the legs during the day moves to the neck at night and contributes to obstructive sleep apnea. Arms- Physical activity reduces the risk of hypertension, or high blood pressure. Heart- A sedentary lifestyle contributes to cardiovascular disease. In people who suffer from heart failure and obstructive sleep apnea, fluid collects in the lungs and neck at night. Stomach- Sitting too much contributes to obesity and colon cancer. Enzymes in the blood vessels of muscles responsible for burning fat get shut off, and the body's method of metabolizing fuels such as glucose and lipids gets disturbed. 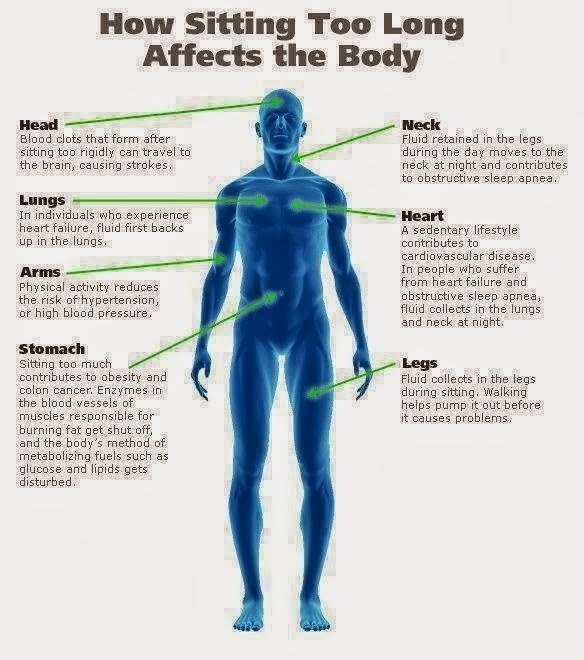 Legs- Fluids collects in the legs during sitting , walking helps pump it out before it causes problems. -The more one stands, the more weight one tends to lose. -The more one stands, the greater one's chances of avoiding heart diseases. - The more on stands, the more energy one tends to have. - The more one stands, the more one's metabolism is boosted. - The more one stands, the more one's chances of fighting unknown sicknesses. - The more one stands, the more flexible one becomes. - The more one stands, the more one's brain and nervous system tends to function. I hope you have been inspired to stand more than you usually do. Please be kind enough to share this post with others and please also feel free to comment below.